A spiral galaxy like our Milky Way being ripped apart as it races at 4.5 million miles per hour through the heart of a distant cluster of galaxies. The galaxy's untimely demise is offering new clues to solving the mystery of what happens to spiral galaxies in a violent universe. Views of the early universe show that spiral galaxies were once much more abundant in rich clusters of galaxies. But they seem to have been vanishing over cosmic time. Where have these "missing bodies" gone? Astronomers are using a wide range of telescopes and analysis techniques to conduct a "CSI" or Crime Scene Investigator-style look at what is happening to this galaxy inside its cluster's rough neighborhood. "It's a clear case of galaxy assault and battery," says William Keel of the University of Alabama. "This is the first time we have a full suite of results from such disparate techniques showing the crime being committed, and the modus operandi." Keel and colleagues are laying out the "forensic evidence" of the galaxy's late life, in a series of presentations in Atlanta, Ga., at the 203rd meeting of the American Astronomical Society. Astronomers have assembled the evidence by combining a variety of diagnostic observations from telescopes analyzing the galaxy's appearance in X-ray, optical, and radio light. Parallel observations at different wavelengths trace how stars, gas, and dust are being tossed around and torn from the fragile galaxy, called C153. Though such "distressed" galaxies have been seen before, this one's demise is unusually swift and violent. 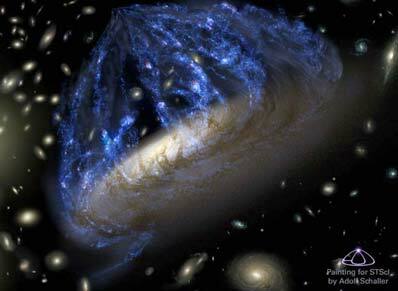 The galaxy belongs to a cluster of galaxies that slammed into another cluster about 100 million years ago. This galaxy took the brunt of the beating as it fell along a trajectory straight through the dense core of the colliding cluster. "This helps explain the weird X-ray and radio emissions we see," says Keel. "The galaxy is a laboratory for studying how gas can be stripped away when it flies through the hot cluster gas, shutting down star birth and transforming the galaxy." The first suggestion of galactic mayhem in this cluster came in 1994 when the Very Large Array radio telescope near Socorro, N.M., detected an unusual number of radio galaxies in the cluster, called Abell 2125. Radio sources trace both star formation and the feeding of central black holes in galaxy clusters. The radio observations also showed that C153 stood out from the other galaxies as an exceptionally powerful radio source. Keel's team began an extensive program of further observations to uncover details about the galaxies. "This was designed to see what the connection could possibly be between events on the 10-million-light-year scale of the cluster merger and what happens deep inside individual galaxies," says Keel. 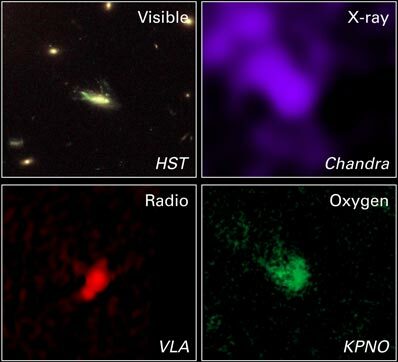 X-ray observations from the ROSAT satellite (an acronym for the Roentgen Satellite) demonstrated that the cluster contains vast amounts of 36-million-degree Fahrenheit (20-million-degree Kelvin) gas that envelops the galaxies. The gas is concentrated into two main lumps rather than smoothly distributed across the cluster, as is more commonly the case. This bolstered the suspicion that two galaxy clusters are actually colliding. In the mid-to-late 1990s astronomers turned the Mayall 4-meter telescope and the WIYN 3.5-meter telescope at the Kitt Peak National Observatory on the cluster to analyze the starlight via spectroscopy. They found many star-forming systems and even active galactic black holes fueled by the collision. 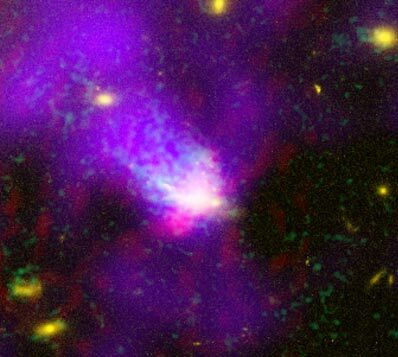 The disintegrating galaxy C153 stood out dramatically when the KPNO telescopes were used to photomap the cluster in color. Astronomers then trained NASA's Hubble Space Telescope (HST) onto C153 and resolved a bizarre shape. They found that the galaxy looks unusually clumpy with many young star clusters and chaotic dust features. Besides the disrupted features in the galaxy's disk, HST also showed that the light in the tail is mostly attributed to recent star formation, providing a direct link to the stripping of the galaxy as it passed through the cluster core. Gas compressed along the galaxy's leading edge, like snow before a plow, ignited a firestorm of new star birth. Evidence of recent star formation also comes from the optical spectrum obtained at the 10-meter Gemini North telescope in Hawaii. The spectrum allows the researchers to estimate the time since the most recent burst of star formation. This conclusion was further bolstered when the Mosaic camera on Kitt Peak's Mayall telescope found a very long tail of extended gas coming off the galaxy. The tail was apparently generated in part by a hurricane of stellar winds boiling off the new star-birth regions and being blown backwards as the galaxy streaks through the surrounding hot gas of the cluster. Spectroscopic observations with the Gemini telescope allowed astronomers to age-date the starburst. They find that 90 percent of C153's blue light is from a population of stars that are 100 million years old. This age corresponds to the time the galaxy should have gone careening through the densest gas in the cluster core. The Gemini spectroscopic observations show the stars are in a regular pattern of orbital motion around the center, as usual for disk galaxies. However, there are multiple widespread clouds of gas moving independently of the stars. "This is an important clue that something beyond gravitational forces must be at work, since stars and gas respond the same way to purely gravitational forces," says Keel. "In other words, the galaxy's gas doesn't know what the stars are doing." NASA's Chandra X-ray Observatory discovered that the cooler clouds detected with optical telescopes and an associated radio feature are embedded in a much larger multimillion-degree trail of gas. Chandra's data indicate that this hot gas was probably enriched in heavy elements by the starburst and driven out of the galaxy by its supersonic motion through the much larger cloud of gas that pervades the cluster. Collectively, these observations offer evidence that the ram pressure of external gas in the cluster is stripping away the galaxy's own gas. This process has long been hypothesized to account for the forced evolution of cluster galaxies. Its aftermath has been seen in several ways. Some nearby examples, Seyfert's Sextet and Stefan's Quintet, are tight clusters that show the aftermath of high-velocity collisions. The galaxy C153 is destined to lose the last vestiges of its spiral arms and become a bland S0-type galaxy having a central bulge and disk, but no spiral-arm structure. These types of galaxies are common in the dense galaxy clusters seen today. Astronomers plan to make new observations with Gemini again in 2004 to study the dynamics of the gas and stars in the tail. The science team members are William Keel (University of Alabama), Frazer Owen (National Radio Astronomy Observatory), Michael Ledlow (Gemini Observatory), and Daniel Wang (University of Massachusetts).